I’m not really sure that this is an actual dessert. 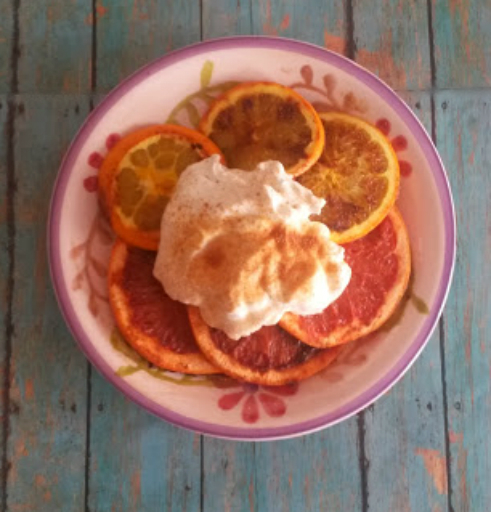 I really feel bad calling it a fruit dessert recipe because it’s just a grilled citrus fruit topped with a little whipped cream and a touch of cinnamon. But it’s good. And it brings some of my favorite flavors of summer together. Basically I could put any food on the grill and it would taste better because it’s summer. Whipped Topping such as TruWhip, whipping cream, whipped coconut cream or a dollop of ice cream. Slice the fruit into thin 1/4-1/2 inch thick slices. Place the fruit in indirect heat and grill for several minutes until lightly browned and visible grill marks are seen.. Flip the fruit over and grill the other side. Sprinkle with sugar if desired to sweeten. Remove the fruit when cooked, remove rinds and top with whipped topping and a sprinkle of cinnamon if desired.